What is the "Super key" on Computer Keyboard? While working on latest versions of Linux based Operating Systems like fedora OS , it is hard to find the "Minimise" button on the top right side of opened applications. So you have to right click on the top of the app and should select the "Minimize" option from the menu. You can also the the short cut Key pair for the command. In fedora it is "Super + H " key combination. For Maximizing the app is "Super + Down ". First time users may be confused about the "Super" key on the keyboard. Now the "Super" key is "Windows" key, ie the key which have Windows logo on it. It is usually placed between the Ctrl and Alt keys on the left side of the keyboard. 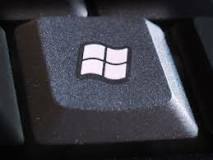 Usually there will be another one on the right side.Recently "Super key" has become an alternative name for the Windows key when using Linux or BSD operating systems or software that originated on these systems.